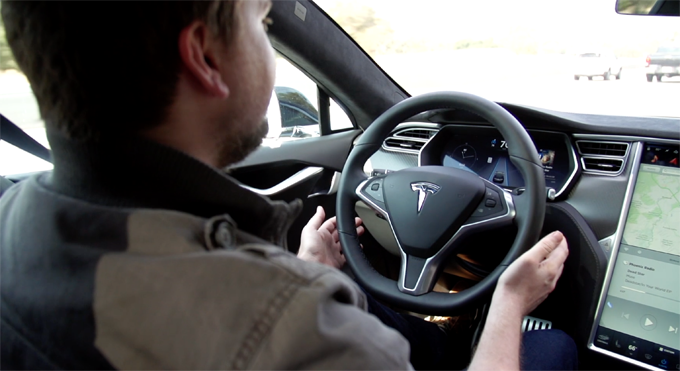 For months now, Tesla has been saying that their cars would soon pick up a whole new trick: autopilot. Later this week, the first of those features will hit Tesla’s fleet — but we’ve already taken them for a spin. We went hands-on (hands-off?) with a pre-release version of the autopilot software, letting the car steer itself down the highway at 70 miles per hour. One big thing to make clear: these features don’t turn the Model S into a full blown self-driving car. You won’t be punching in your destination and laying back for a nap; instead, these features are meant more to make your long highway commutes less painful. Elon Musk says he sees full automation coming within about 3 years; this is just a big first step. So what can it do for now? It’ll also change lanes for you — just pop on your turn signal, loosen your grip on the wheel, and it’ll merge over as soon as the way is clear. The autosteer features will work on city streets — but given that the car currently doesn’t recognize things like stop lights, it’s not advised. You’d be taking over manually every few seconds… or, you know, blasting through stop signs. Tesla is being pretty careful to caution that the features are really meant for the highway only, right now. Tesla’s autopilot/autosteering stuff works by combining data from four sources: ultrasonic (SONAR) sensors to look for cars around you, a forward-facing radar that can see through fog and rain, a forward-facing camera that handles computer vision voodoo like looking for speed limit signs, and high-precision GPS mapping data that acts as something of a second layer for when the built-in vision system needs a sanity check. Oh, and it’ll parallel park for you, too. That feature has made its way into other cars, of course — but it works well in the Model S. It’s fast, and perfectly smooth. It doesn’t feel like you’re being parked by a robot; instead, it feels like you’ve got a really talented human parking the car. We’d need to spend more time with the autopilot features before we really gave it that good ol’ TC stamp of approval — but in our short test period with it, I can say it seemed to work well. Once I trusted the car to do the steering and loosened my grip, it was a pretty mindblowing experience. There were times when the system tripped up, but it did so gracefully. At no point during our test did it feel like the car was doing anything unsafe, nor did I ever feel like I couldn’t immediately retake control. A few times, though, things that I was expecting to happen just… didn’t. I’d tell the car to switch lanes; instead, it just stayed its course, keeping me perfectly in the lane I was already in. A Tesla rep tells me that this may have been due to the lighting conditions at the time; if the car’s AI isn’t 100% confident that it’s safe to change lanes, it just won’t. Better to have a driver take over than to autosteer into something it somehow missed, right? Tesla’s autopilot features will work on Model Xs and Model S built after September 2014, though a one-time fee of $2,500 (generally paid at time of purchase) is required to turn the features on. These features should start rolling out, along with some visual/UI changes to the car’s in-dash touchscreen interface, tomorrow.